Once a rough mule trail, Sani Pass is now a notoriously dangerous mountain road to Lesotho via the Drakensberg Mountains. 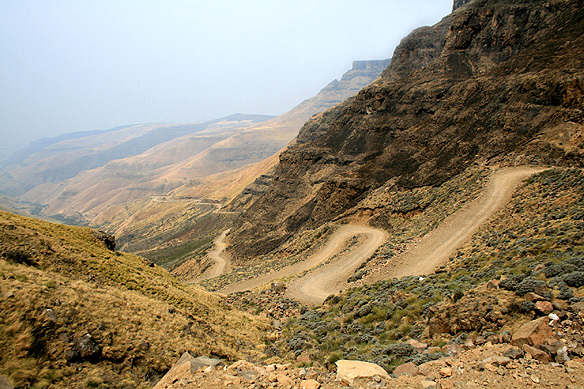 Lying between the border controls of South Africa and Lesotho, the 8 kilometre gravel road through no man’s land starts at 1,968 metres above sea level and ends near the summit at 2,873 metres. This entry was posted in Global Travel Shot and tagged Adventure Travel, Drakensberg Mountains, Sani Pass, South Africa by Rama Arya. Bookmark the permalink. Hey, thanks. 🙂 You are a friend of Shivani Khetan and Gurinder Osan, aren’t you. Your name is familiar.